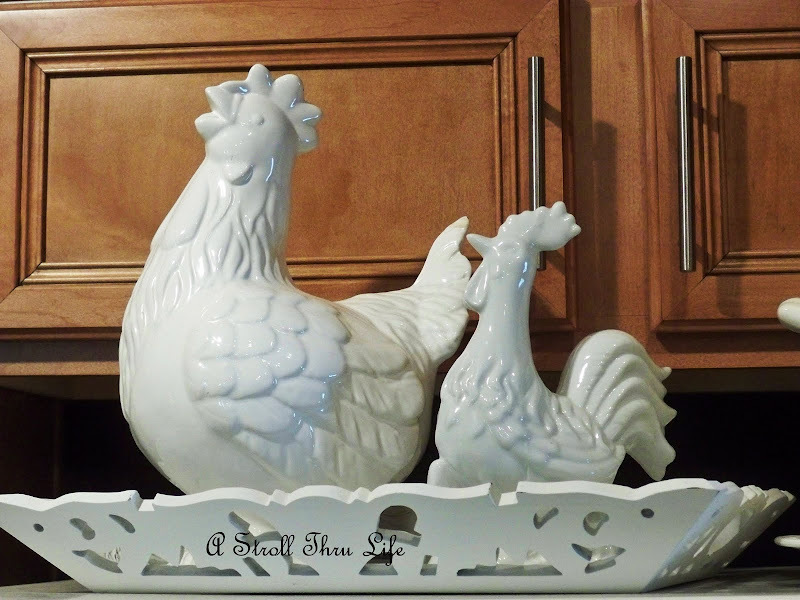 This big white rooster has always had attitude, but as fashionable as white/white is, my house just works better with off-white or a little bit of beige. So he needed a makeover of some sort. My trusty stain and a few wipes with a soft cloth and he started to look a whole lot better. He still needs a little more of the stain rubbed off to be perfect. Now he looks great. Shows a little bit of character, and still an off-white. When I wiped the stain off, I left it with a few streaks to look like feathers. I thought that looked better than just wiping it all off. Now it fits so much better in my kitchen with the dark walls. I love his attitude and he is definitely strutting his stuff. You did a Beautiful job on your Rooster he looks so good with his makeover.. Marty you are so Good!!! I would like to thank you so much for coming over with a sweet comment on my Tablescape. You did a great job, he looks fantastic - thanks for sharing. Marty, I'm going to do that with the big white sheep I have. I'm like you and things in my house just look better, sometimes in off white or ivory. I think that sheep is just too white. Mr. Roo is looking good with his new do! I like that you left a little streak here and there. Very nice! Very clever Marty...and I agree he does have an attitude now! Isn't he just so cute! 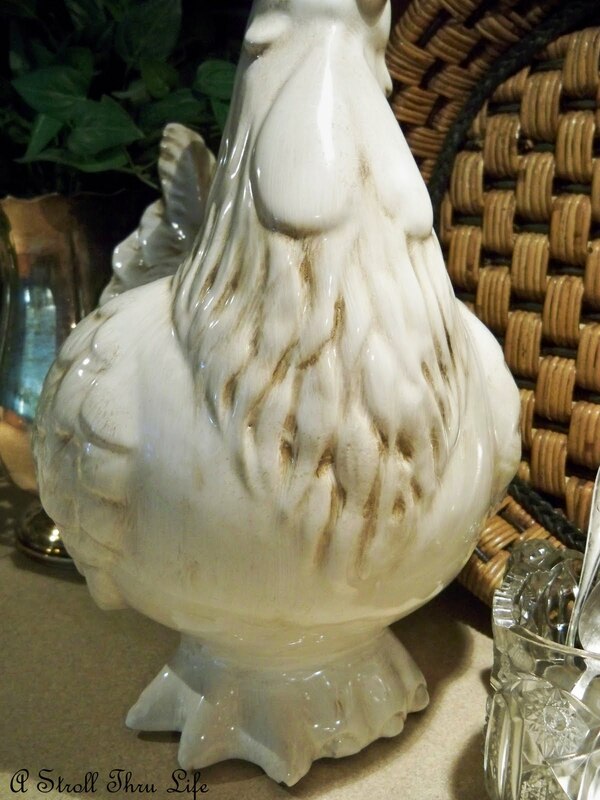 I love how the stain added just the right touch to his feathers. He really looks nice with a few brown feathers. Great job as always Marty! Oh, I love it! A little made all the difference! 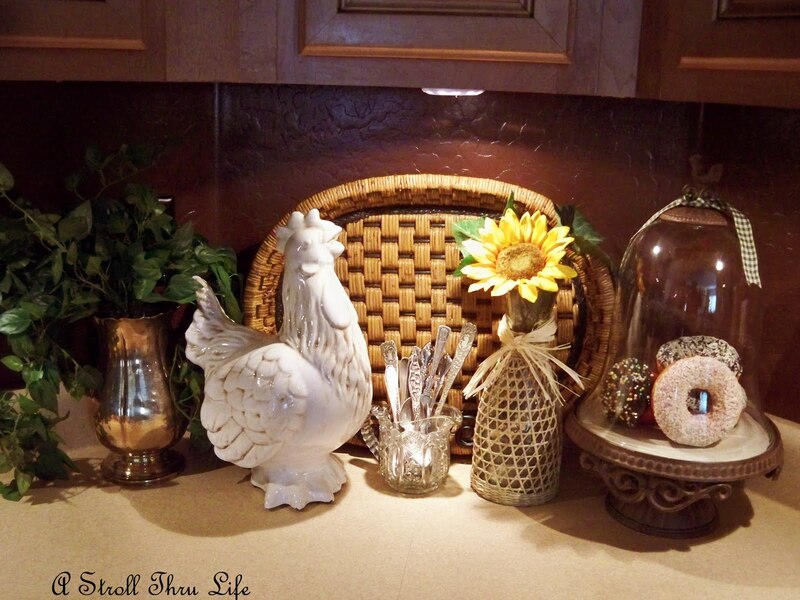 I have a few roosters that were purchased a thrift store to put in the yard. I've never liked the colors..I think this would be a perfect idea! You are one smart lady...The chicken looks great...good job! Wow, you really did a great job. Love the details the stain brings out. Nicely done. HI Marty! 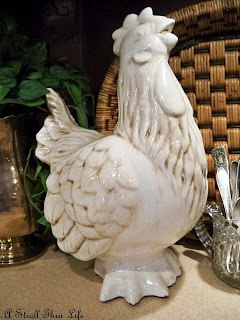 You're so good and your Rooster looks marvelous! Mr. Roo is strutting fine now! 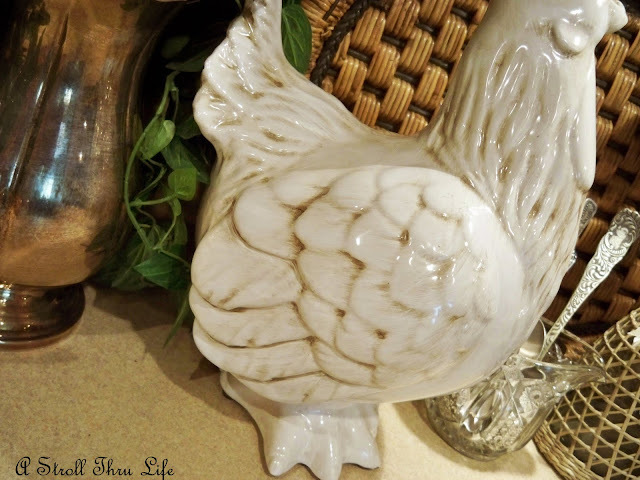 Hi Marty,,,, I love how your gorgeous rooster came out... it looks so pretty sitting on your counter... great job.....have a great week. Oh Marty, I love your Roo with an attitude! He looks great. 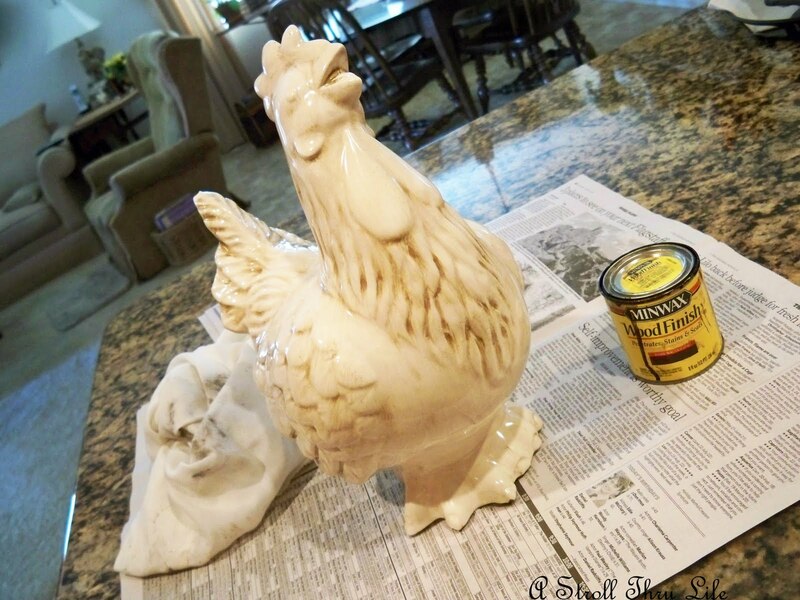 Who'd-a thought you could stain a ceramic rooster. My oh my. Richard at My Old Historic House. Marty !!! Oh my goodness I had no idea that ceramic could be stained like that !! It looks GREAT! Love the new dark outlet covers too. Marty, I crown you the queen of adding stain to things and they just look terrific. Now the detail shows up so much better. Thanks for joining the party. I thought he was pretty white but I do like him as he is now! Great job! Now that's smart. I love it! He looks fantastic with his new look. Looks great.. you are so good at dressing up something! Marty, you amaze me when you do stuff like that. I would have totally messed that poor rooster up! lol You did a wonderful job. So much nicer with the stain it gives it such an antique look. Will have to redo a piece I did with acrylic paints. Love the rooster's new look! It does add character, love it! Great transformation. You were right - he does fit in with all of your colors much better! It looks great, and by gum it makes me want to stain my yard hen in the kitchen like the little copycat that I am. "Mr. Roo with an attitude" certainly seems to be strutting his stuff a little more now with that added stain. I didn't realize the stain would work on something with a shiny finish - so happy to see how beautifully this turned out. Minwax Dark Walnut is a staple in my craft stash. Love your sweet Roo Marty!